While I was announcing the 2017 BSRI results with quite a bit of delay, I thought that we could all benefit from discussing more lengthy with the one who managed to optimize it at best. The one who manage to make it reach dizzying levels, involving much more savings, therefore investments, and then financial independence very early in his life. So I asked the only Badass Saver Platinum (i.e. the nickname of those who go above the 70% level of the #BSRI if he would be willing to answer a few questions to inspire us to keep on improving our savings level. He said yes! I obviously talk about Oliver from Frugalisten.de, and I would like to thank him again for accepting my invitation. Oliver is 29 years old and lives (together with his girlfriend) in Hanover (Germany), where he currently works as a software developer. 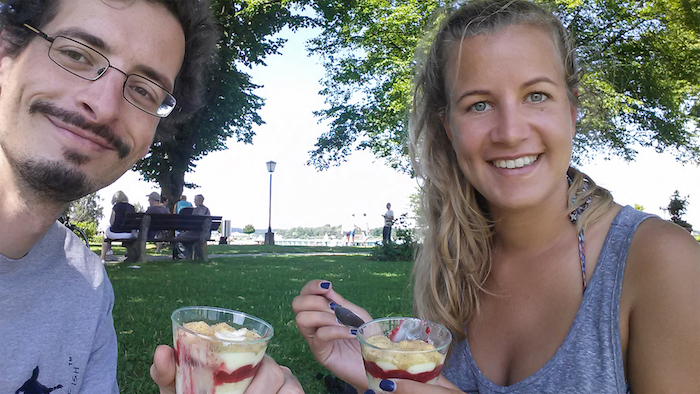 On his blog frugalisten.de he writes about how he leads a happy and fulfilling life with much less money than the average German and how he wants to become FI before his 40th birthday. I have included in my list of questions the responses to the survey I launched a few weeks ago. But feel free to add yours in the comments section below. 1/ How do you compute your savings rate to be sure that we are all on the same page? To calculate my savings rate, I take my net income and subtract all my expenses. My net income consists of my regular job income after taxes and health insurance have been deducted, as well as income from side hustles, selling stuff on ebay or money I get e.g. as a birthday present. I don't however count investment income (capital gains or dividends) as income, because they stay in my account or are just accumulated within my investment portfolio. My expenses include rent and bills, food, insurances, holidays and travel, or "fun stuff". Since tax and health insurance have already been taken from my job income, I don't count these as expenses – I simply calculate my savings rate from my net income. Currently, I don't have a company pension scheme (2nd pillar or "bAV" in Germany), but when I had one during my time in England, I counted these contributions as income as well (including what was added/matched by my employer). 2/ How much do you make each month? How many and what are your income streams exactly? In 2017, I earned approximately 2.800 € per month on average. Most of that came from my main job as a software developer, as well as a period of three months at the end of the year, during which I worked as a freelancer for a relatively high salary. Another 200 € per month (on average) came from a few side hustles as a web designer. About 50 € were gifts of money or revenue from selling stuff on Ebay. In 2018, I reduced my working hours as a normal employee to 24 hours per week, in order to work more as a freelancer, where I get a higher hourly pay. This way, I try to generate a similar total income as last year, but with slightly fewer working hours. 3/ Regarding expenses: what are your three highest monthly expenses? And how much are those? My single largest expense is my part of our rent, which amounts to 300 € per month, including all bills and internet. 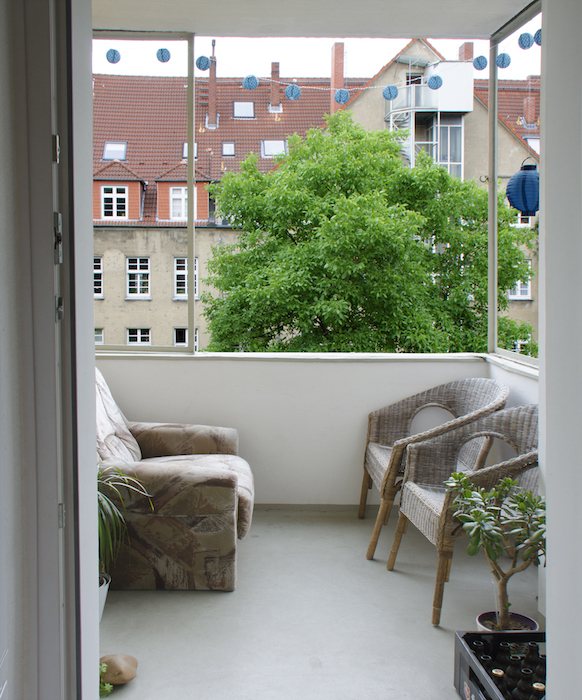 I share a nice flat in central Hanover with my girlfriend – we have two rooms, a kitchen, a bathroom and even a quiet balcony. The second largest expense is food, which is abound 100 € for groceries per month (on average) and another 40 € for the occasional eating out or takeaway. My third largest expense are travel costs of around 60-80 € per month in recent years. Of course, these are average numbers, so I didn't take a trip for 80 € every month. Normally, I do 2-3 trips per year that cost a few hundred Euros each, and a couple of less expensive journeys here and there, like visiting relatives or friends over the weekend. And then there are some months where I don't have time to travel at all. After that comes expenses for social activities, parties and going out with friends, which amount to around 40 € per month. In 2017, I also spent an unusually high amount in the "tools and household items" category. Since my girlfriend an me moved together in our first own flat, we had to buy things like a fridge, a washing machine and some furniture (most of it used from classifieds, of course ;)), which pushed the monthly average in that category to little over 50 €. 17 € per month. I have a personal liability insurance and an accident insurance (health insurance is covered through my employment). 80 € per month on average. 40 € per month for eating out or takeaway. Every few years, I need new glasses for around 100-200 €. 50-60 € per year. I rarely buy new clothes and usually only replace stuff that is falling apart. That doesn't include shoes, however. Since I buy my shoes mainly for skateboarding, I count these as sports equipment rather than clothing. 8 € for my share of our landline/broadband connection (32 Mbit/s internet and unlimited landline calls). Almost 0 € for my current phone contract – it was a special deal that included a smartphone which I sold on Ebay. That covered the costs of the contract for the entire contract period. I still have 1 GB of data, 50 minutes of calls and 50 texts per month included. About 100 € per year for skateboarding equipment and shoes. Shoes wear down pretty quickly from skating, so I have always been buying them on Ebay for a lot cheaper (usually worn not more than a handful of times). During the winter season, I had to go to an indoor skatepark, which added another 20 to 80 € per month (depending on how often I went). Luckily, a new skatehall is opening up in biking distance next winter season, which will lower the costs significantly. About 20 € per month. With my girlfriend and most of my family members, I made the agreement to not buy stuff for each other. We rather take a trip together or go out for a meal. 5/ Regarding your rent/home: do you do any kind of house hacking? Or are these standard prices in Hanover? Our flat is certainly at the lower end of the price spectrum, but I wouldn't consider it a hack. Luckily, Hanover is not as expensive as other European cities yet. 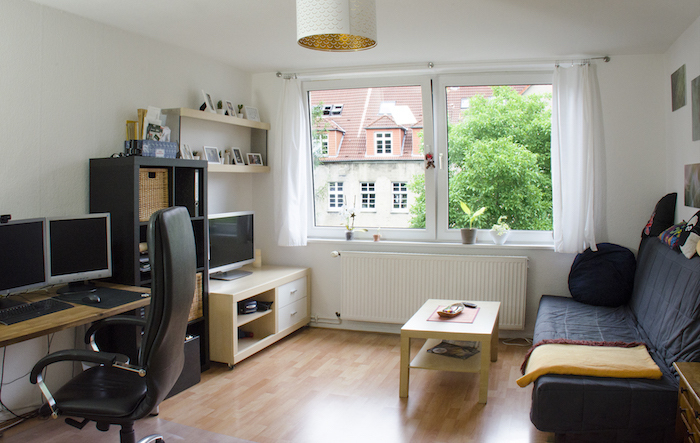 The comparably low rent is mainly due to the size of the flat: Many Germans would consider 46m² more appropriate for a single person rather than a couple. We don't share that opinion, though. ;) The flat is layed out very well and as Mustachians/Frugalists we don't have as much stuff as others, so we still have plenty of free space. 6/ How many people live under the same income streams (single/married/how many children)? Although I live together with my girlfriend, we have kept our finances separately so far. She earns her own money, so I don't have to support anyone but myself from my salary (at least for now). 7/ What do you eat for only spending 100 euros per month? Do you have an example of monthly grocery list? I mostly buy simple, basic staples and cook my own food from scratch. Stuff live chickpeas, beans, carrots, onions, apples, tomatoes, nuts or oats are super healthy and cost almost nothing. If you add some spices and smaller amounts of more exclusive ingredients here and there, you can cook amazing dishes for a bargain. An example of what I eat over the course of a whole day can be found on my blog. I don't necessarily buy only organic, but I try to at least avoid ready-meals and industrial foods. These are usually just sugar, fat and flavourings in colorful boxes, serving mainly the food producers' profits (rather than the health of the consumers). I am also vegetarian (not solely for financial reasons), which might contribute to my comparably low food expenses as well (meat is typically quite expensive). 8/ What are you sacrificing to get to 70% that you wish you could have? In terms of spending and consumption, I don't really sacrifice anything. I personally enjoy living a simple life with less clutter and a smaller footprint. I don't have a fixed budget and usually buy whatever I want, which simply isn't that much. So even If you gave me one million Euros tomorrow, I probably wouldn't change my lifestyle at all. What I do sacrifice in order to save that much, however, is a little bit of time. 9/ Why don't you work less and enjoy life/have more free time NOW? I personally try to find a good balance between saving for early retirement and working less today. This was one reason why I scaled down my employment to part-time. Full-time employment just didn't feel like the right tradeoff. Now I work only 30-35 hours per week in total, and the freelancing part gives me much more flexibility. And I am still able to save a lot. 10/ Why did you stop at 70%? When do you plan to reach 71%? I don't really have a certain savings rate goal. I just try to earn money, spend it as wisely as I can, and the savings rate is simply the result of this process. So if my savings rate happens to be 74 % next year: cool! If it goes down to 56 %: still fine. I think a savings rate can be a good motivator for yourself and it's cool to compare just for fun (and in order to get in touch with other bloggers and fellow Mustachians, as you can see ;)). But I don't think we should stress ourselves about it. In the end it's just a number. 11/ How did you get your partner aboard about financial independence? Luckily, my partner has never been overly spendy or materialistic, so I never needed to have "The Talk" or find cunning ways to convince her of the FIRE philosophy. Also, when I first heard about Mustachianism about 5 years ago, we were still students and had not experienced massive lifestyle inflation yet. That certainly helped a lot, because I didn't have to change my lifestyle much in order to start saving and she didn't have to adopt to any great change from my side. When we started to work and earn money, I tried to keep an eye on lifestyle inflation. For example, when we were looking for a flat, I simply asked: "Wouldn't a small flat be totally sufficient for us? Look, we don't really have much stuff, and more space wouldn't make us happier – but the lower rent would make our financial situation much more relaxing." Usually, she agreed with my suggestions – or we found a compromise that we were both okay with. Generally, I think the best you can do to get a partner aboard is to lead by example. If you can demonstrate that you live a much happier and fulfilled life and get much more choices and freedom by living frugally, he or she will very likely adopt at least some of the principles over time. 12/ How do you explain your wealth to your family/friends who just think you are lucky? My family and friends all know my blog and some of them even read it regularly. So I don't have to explain much, because everyone can read it on the web. Since I publish all my numbers as well, everyone who reads the blog will get a good idea what is going on. If someone isn't interested or doesn't like what I am doing – that's fine, but at least I had the opportunity to explain myself. But usually I get positive feedback. Some of my friends even ask me more detailed questions about investing or saving or tell me that they adopted some of the FIRE principles themselves after reading my blog. 13/ What are your best tips to stop spending on things you dont need but want? What helped me a lot was gaining knowledge and creating awareness about the hedonic treadmill and the environmental impact of the consumer society. I realised that if I buy a shiny new thing, I will get a short spike of happiness, which very quickly reverts back to baseline – but the money is wasted and can't be used to buy me more freedom. I also watched videos like "The story of stuff" or "Wake up call" by Steve Cutts and I read the book "Liberation from excess" by Niko Paech. These were eye-opening and made me aware that every purchase comes with environmental costs that are sometimes a lot higher than the price tag. Once I had fully digested that buying unnecessary stuff doesn't make me happy, wastes my money AND destroys the planet I live on, I automatically stopped wanting these things in the first place. Thanks again to Oliver for taking the time to inspire us with his simple but so effective way of life! Do you have any more questions for him? Just ask directly in the comments section below.